So Swift Internet is a WISP….what is a WISP? A technician will come to your house to do a “site survey”. During the site survey the technician will determine if you have line of site to one of our many towers. In a normal setup an antenna (dish) is installed on the outside of your house. From that dish we bring a cable into the house and connect it to a power supply. From the power supply an ethernet cable can plug directly into your computer or into a wireless router. What are the total costs for a typical install? There is no installation fee, no commitments, no contracts, and no rental fees! we only require the first month paid up front. Is Wireless the same as “satellite” Internet? NO! Wireless uses ground-based antennas to transmit data to your location. Also, satellite systems have higher “latency” (the time it takes data to travel between 2 points) since the data has to travel from your location up to the satellite 22,400 miles up and back down to the Internet, making streaming video and gaming very difficult to run at all. Can I watch Netflix and YouTube, what about Skype or VOIP services? Of course. Our High Speed Packages can all handle on-line video streaming and voice services. Refer to Pricing for details. I already have email through another provider , will I get to keep it? No, most providers will delete your e-mail when you leave them. We do not provide e-mail services. We will make sure every new customer has an online/free e-mail account (Hotmail, Gmail, ect…) before everything is setup. Can I change my package if I decide I need more or less speed? Yes. If you’re unsure which package is right for you, we can help you choose the right fit. You can send us an email or call us and we can change your package within minutes. Can I use torrent programs on your network? Your connection is always on and always available. You may download as much as you wish. We just ask that you respect this offer and only use bandwidth that is required. However, we do recommend that if you are using file sharing utilities (torrent programs) that you turn off sharing with other users and be sure to close your program when you are not using it. File sharing left on can generate enormous amounts of bandwidth if not watched closely. In the unlikely event that we need to limit your connection to prevent security problems you will be notified. Yes. We use encryption with stronger security than what is used by ADSL and most cable providers. We also monitor the network to ensure that there are no problems. In the unlikely event of a virus or other security problem on the network, you may be contacted. The biggest risk to users is attacks that originate from the Internet. We highly recommend that all users employ a virus scanner, spyware scanner, firewall and use safe browsing practices. Can I get my own dedicated static IP address? Yes. Upon request we can assign you your own dedicated IP address at no extra charge. I’m not sure if my place has a good enough line of site because of trees. Are you sure I can get Internet? In most cases, yes. Swift Internet will only do an installation if we’re 100% certain it will work. Contact Us to arrange for a free site survey. Yes, you can, we just ask that it be secured with a password so no one in your neighbourhood gains unauthorized access. If you do not own a wireless router, we carry these, and can provide you with one during your installation. The install date is your billing date, you will receive an automated email with a pdf of your latest invoice with a link to the Customer Portal. You can pay via the Customer Portal with Visa, MasterCard, or direct bank withdrawal. We also have a down town office location open Monday to Saturday 8am to 4pm where you can pay cash, cheque, debit or Visa/Mastercard directly. We also have a 24 hour drop box at our Office in down town Creston where you can deposit cash or cheque. You will be notified via an automated email 5 then 1 day(s) before your bill is due as a reminder. If you forget to pay your bill after that, your Internet access will be blocked and redirected to the Customer Portal where you can make a payment. Your Internet will automatically re-enable once payment has been made. What if the equipment/dish is faulty? Who pays? Who owns the dish? The Equipment is owned by Swift Internet, so if it breaks (not due to negligence), it will be replaced free of charge. Technology is always moving ahead. And so do we. All of our network hardware gets updated as needed. We are constantly changing our network to use the latest, cutting edge equipment to provide fast speeds, with reliable access for our customers. Do I need to groom the foliage around my dish? No need, all equipment on Swift Internet’s network is monitored very closely. 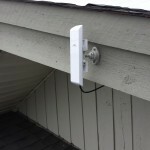 The equipment (dish) on your house will email Swift Internet should the signal level become unacceptable. We will then phone and make arrangements for a site visit to restore the signal quality. Can I turn the dish off when on holidays? We recommend that the equipment power adapter be left on at all times. It consumes a very small amount of power (4 watts). We also prefer the equipment be left on due to possible scheduled upgrades early in the AM. Can I put my account on hold for holidays? Just send us an email with dates you want your Internet turned off and back on and we will accommodate you. There are no charges or connect/disconnect fees but the minimum disconnection duration is one month. Does Swift Internet monitor my connection? Swift Internet does not monitor the content of your browsing at all. We do have full historical data on ping/latency and signal strength of your equipment for diagnostic purposes. No, all our Internet packages have unlimited data. With our redundant routes we can usually do hardware upgrades and repairs with very little downtime. This is due to our efforts to repair broken equipment in a timely and efficient manner. All of our network is monitored 24 hours a day, and pro-actively maintained to give you the best service possible. We provide the reliability that you expect, from a company you can trust. Dual upstream providers who utilize different routes in and out of Creston BC. Dynamic OSPF routing within our network to automatically route around problem areas (a tower going offline due to lightning or otherwise). Battery backups with run-times greater than 48 hours on all tower sites. 4 day battery backup to provide extended run-times on the major “ring” that makes up the backbone of Swift Internet’s network.